Place salmon in a plastic or glass container and rub both sides with the salt. Cover the container and chill in the refrigerator for 24 hours. Rinse salmon thoroughly and soak in a bowl of cold water for 30 minutes, changing the water once, after 15 minutes. Remove fish from bowl and pat dry with paper towels. Dice fish and place in a mixing bowl. Add tomato, onion and green onions; toss gently to combine. 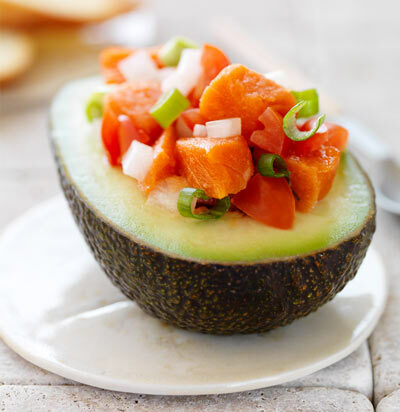 Mound salmon mixture onto each avocado half. Garnish with cilantro or chives and serve immediately. Note: If onion is not sweet, soak the diced onion in cold water for 10 minutes to remove bitterness.